Authorities found the 18-year-old with his mother’s severed head in one hand and a knife in the other. A US TEENAGER has been arrested for allegedly cutting his mother’s head off with a butcher knife, police said yesterday. 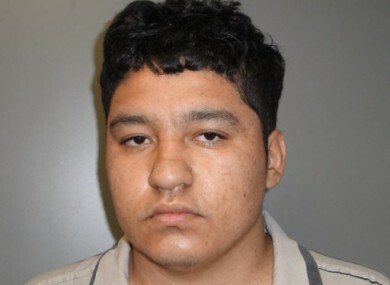 Authorities found Oliver Funes Machada, 18, on Monday in the front yard of his house in a small town in North Carolina as he held his 35-year-old mother’s severed head in one hand and the knife in the other. “The nature of the scene is kind of graphic. There was a decapitation and when the officers arrived, he was with the decapitation in his hand and it was a gruesome scene,” said Franklin County Sheriff Kent Winstead. The body of the mother, Yesenia Funes, was found inside the house. Two small girls aged two or three were also in the house and in seemingly good condition, Winstead added. The attack happened in the small town of Zebulon near the capital city Raleigh and it was Funes Machada himself who called the authorities after the killing. The teenager surrendered without putting up resistance and has been charged with first-degree murder. Authorities are evaluating the mental state of Funes, who’s been described as “profoundly disturbed” by his attorney. His public defender, Louisburg attorney C. Boyd Sturges III, said in a phone interview that he spoke with Funes Machada for an hour in the Franklin County jail. Neighbor Randy Mullins said he believes the other children were the suspect’s siblings. Mullins was leaving his house minutes after the first deputy arrived and he said he saw the woman’s head lying in the front yard about five feet from the porch. The deputy appeared to have just handcuffed the suspect and seemed rattled when Mullins approached to ask if he needed help. “You could see in his face he had a lot of concern. I’m not saying he was scared, but you could tell he was concerned,” Mullins said of the deputy. Mullins then went back to his house across the street and told his 91-year-old mother to stay inside. He said a half-dozen more law enforcement vehicles arrived within minutes and a deputy covered the woman’s head. Email “'It was a gruesome scene': Teenager arrested for allegedly decapitating mother in US”. Feedback on “'It was a gruesome scene': Teenager arrested for allegedly decapitating mother in US”.